DENVER -- NFV & Carrier SDN -- Bill Walker has seen a thing or two during his telco career, and he shared some of his insights during his keynote address on Wednesday at Light Reading's NFV and Carrier SDN event. Walker, director of network and cloud architecture for CenturyLink, said his team members like to send him pictures to include in his presentations, some of which he used when he went over his "Bill's Big Rules for Transformation Success" near the end of his keynote. While taking a humorous view of some important transformation topics, Walker stressed that all of the content and verbiage of his rules were his opinions and not CenturyLink's. So let's dive into Bill's Big Rules by clicking on the image below. "There are tons of training partners out there that can give you a week of training on some virtualization technology, but if they're not doing it, it's going to be useless," Walker said. "If they're not using it every day, it's useless training. 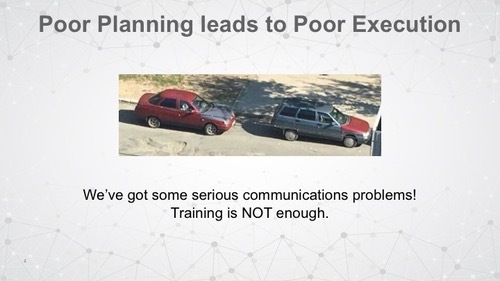 So not only training, but living it and communicating it across the different technology groups is key. Training is never enough."